I’ve eaten pizza at many of the most well-respected pizzerias in America. For starters, Di Fara in Brooklyn, Pizzeria Bianco in Phoenix, Frank Pepe in New Haven, Pizzeria Beddia in Philadelphia, and Great Lake in Chicago before it closed. They and so many other great places have their merits. But I’m going out on the line and putting a decade of pizza cred built by writing about and visiting hundreds of pizzerias in New York City and across America to say that Buffalo-style pizza is America’s most underappreciated regional style. There, I said it. I’m in love. Buffalo serves some awesome pizza. Let’s be clear: you can, to a lesser degree, get New York-style pizza in Buffalo. The Neapolitan-style wave has landed in the city, too. Pizzaiolo Jay Langfelder’s pizza-truck-turned brick-and-mortar restaurant, Jay’s Artisan Pizzeria, could be put up against well-regarded masters of the genre in America’s other great pizza cities. Roost, chef Martin Danilowic’s restaurant in the Crescendo building on Niagara Street on the West Side, serves a tidy menu of pizzas that would cause as much of a stir in New York City as some of its trendier new places, where they plate their pizza in one of the most unique ways I’ve ever seen. They and a handful of other non-Buffalo-style pizzerias are worth checking out, but you can get those styles of pizza elsewhere. You can’t really find Buffalo-style pizza in other cities. The dough has the lightness of a focaccia, there’s always lots of cheese, and while the sauce does happen to be slightly sweet, that ends up being a nice contrast to the spicy oil pooled in the copious charred, meaty pepperoni. Buffalo-style pizza has been described as a hybrid of Chicago deep-dish and New York, or somewhere between Detroit’s airy, high-lipped cheesy crust and New York City’s traditionally thin-crust pies. 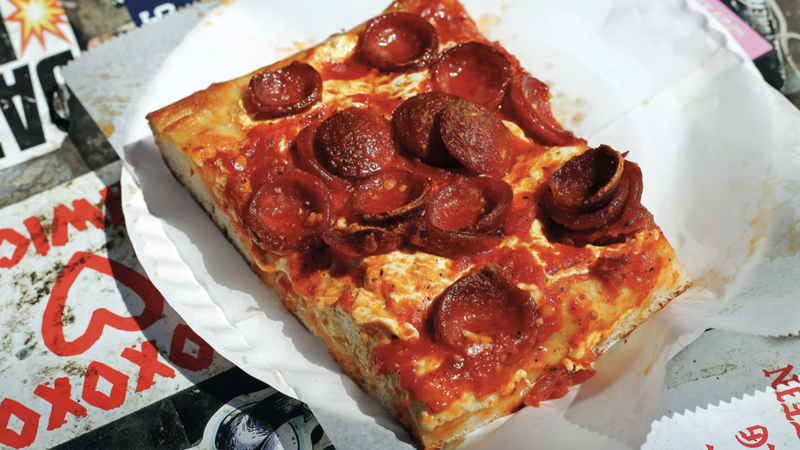 It’s also been compared to a circular version of Sicilian-style pizza, but there’s less structure to the undercarriage of Buffalo-style pizza and its signature sweet sauce is nothing like what you get at places that make the best Sicilian slices. I’d flip the description. Buffalo-style pizza is typically a cup-and-char pepperoni pizza, one with a slim, sometimes non-existent crust coastline with ingredients out to, and sometimes even over the edges, a thick, airy undercarriage with little to no structural integrity that’s topped by a sweet sauce and enough cheese to nearly always guarantee a cheese pull. If you were going to use other regional styles to describe it, I’d say it’s a Detroit amount of cheese with a Motor City trim, a Maine undercarriage (think Portland’s Micucci’s or Slab), and a New York City soul. According to The Buffalo News, the number of pizzerias went from 62 in 1969 to 274 by 1989 to 360 in 1998. Keep in mind that over that period of time, according to the census, the population went from 462,768 to 292,819. Today? There are fewer people (256,902). But, at least according to Buffalo’s local tourism agency Visit Buffalo Niagara, at last count there were more than 600 pizzerias in Buffalo and its immediate surrounding urban area. That means if we’re conservative and say just 600, there’s at least one pizzeria for every 428 people in the Nickel City. Compare that to New York City, whose some estimated 1,600 pizzerias serve 8.538 million people. That’s right, New York City, which has 33 times the number of people as Buffalo, per capita, has less than four times the number of pizzerias. And you thought you loved pizza. For the pizza-lover uninitiated in the Nickel City, Buffalo should be a pizza destination, though because of a pizza culture largely based on takeout, it’s one of the country’s great cities for pizza while eating it straight from the box in the parking lot on the hood of your car, or with the box warming your lap with the smell of hot cardboard, melted cheese, and cup-and-char pepperoni on a cold winter day. And that is the move for pizza nerds, because the truth is that Buffalo pizza isn’t a style that I’d say improves as it sits. There’s something about the excess of cheese, pepperoni grease, and cup-and-char that really exists at its peak perfection when it’s fresh from the oven. America’s pizza culture is generally traced back to Lombardi’s in New York City in 1905. Buffalo’s pizza culture goes all the way back to 1927, when Fioravanti Santora started selling pizza by the slice out of his homemade ice cream shop. That means Buffalo’s oldest pizzeria preceded New York City icons like Patsy’s (1933) and John’s of Bleecker Street (1929). Frank Pepe of New Haven, generally regarded as one of America’s best pizzerias, was founded just two years before Santora’s, in 1925. Outside Buffalo, the city’s probably most well-known as being represented by Bocce Club Pizza. But articles written by folks who sweep in and out of town after a few days get an incomplete picture of the pizza scene. Bocce Club is a great pie, and it’s a great Buffalo-style pizza, but Buffalo-style pizza is not Bocce Club Pizza. Sure, it has cup-and-char, a thick but airy crust, and a sweet sauce, but if you look at it side by side with some of the city’s other pizzas, you’ll see the difference. Nobody else does toppings that go out past the crust. And in Buffalo, the distinction of best-known pizza is shared with La Nova. Wherever you go in Buffalo, prepare yourself for some of the cheesiest, most pepperoni-topped, and indulgent pies you’ve ever had. This is hibernation pizza. Prepare for a pie that isn’t a gut-bomb, but that probably doubles or triples the caloric intake enjoyed in a New York City slice. You probably couldgo outside and shovel, but wouldn’t it be more fun to just stay inside and have a few drinks? Pepperoni as a baseline? I can get behind that. And I’d argue that in an era where pizza lovers are falling in love again with America’s regional styles—the Emmy Squareds of the world popularizing Detroit-style pizza, Speedy Romeo drawing attention to aspects of St. Louis-style, Slice pizza blogger turned pizzaiolo Adam Kuban demonstrating the appeal of bar pizza—Buffalo pizza could be the next big thing. In fact, I’d argue we’re already eating it: Domino’s and Papa John’s sweet sauces and lack of structural integrity have more in common with Buffalo-style pizza than a slice at Joe’s. And while I’m doing a disservice to Buffalo pizza by mentioning both of those national chains, my point is to draw a line of comparison to the financial and nationwide success those qualities have already exhibited. Before we get back to all the great places in Buffalo, I’ll go one step further. There’s a slice shop in New York City’s NoLita neighborhood called Prince Street Pizza that replaced the original Ray’s Pizza. Before it opens, there’s usually a line out the door for the Spicy Spring square slice, a light, airy pock-bottomed crust weighed down with a copious cheese coating and a healthy ladling of fra diavolo sauce. There’s little structural integrity and the slice is known for being topped with so many small curled up slices of spicy-oil-filled, black-edged pepperoni that they spill off the sides onto the plate. Sure, it’s a square and yes that sauce is a little spicy, but that Instagram darling, that super popular Spicy Spring slice, that’s pretty much Buffalo pizza. Get your copy of Arthur Bovino’s Buffalo Everything tomorrow! Excerpted from Buffalo Everything by Arthur Bovino. Copyright © 2018. Used with permission of the publisher, Countryman Press. All rights reserved.